Home Tags Posts tagged with "typhoons"
Typhoon Haiyan death toll has risen above 5,000, officials in the Philippines say, two weeks after the devastating storm hit the country. Philippines’ National Disaster Agency says that 5,209 people are now known to have lost their lives, with many more still missing. That makes Haiyan, known as Yolanda in the Philippines, the deadliest natural disaster in the country’s history. Floods in the Ormoc region in 1991 killed 5,101 people. Haiyan was one of the most powerful typhoons ever recorded. 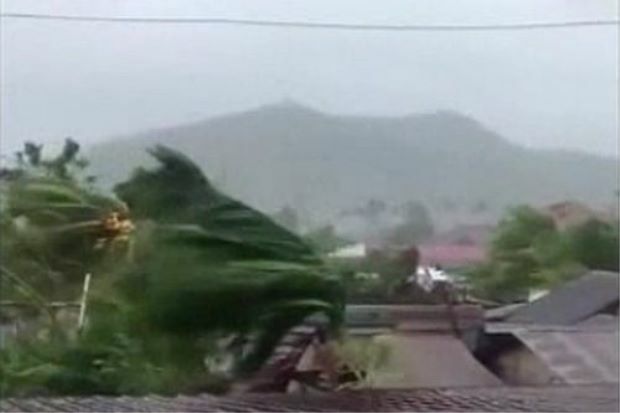 Winds of up to 270km/h hit the central Philippines when it made landfall on November 8. Parts of low-lying islands were completely flattened. Eduardo del Rosario, executive director of the Philippines’ National Disaster Risk Reduction and Management Council, said that more than four million people were displaced by the storm. Over a million houses were damaged. Many residents in the worst hit areas are still without proper shelter as they try to rebuild their homes. Eduardo del Rosario told the Associated Press news agency he believed the worst was over. “In the first week we can say we were in the emergency room,” he told the agency. He said he believed that the number of dead reported in the city of Tacloban was likely to go up. The capital of Leyte province has reported 1,725 deaths. More than 1,600 people are missing across the affected region. Most of the dead had been buried in mass graves, and many bodies were unidentified, Eduardo del Rosario said. According to Philippine officials, around 10,000 people may have died in just one area hit by Typhoon Haiyan. Typhoon Haiyan – one of the worst storms on record – destroyed homes, schools and an airport in the eastern city of Tacloban. Neighboring Samar island was also badly affected, with reports of 300 people dead and 2,000 missing. The Philippine government has so far only confirmed the deaths of 151 people throughout the country, but hundreds of thousands have been displaced. There’s no clean water, no electricity and very little food. City officials said they were struggling to distribute aid and that looting was widespread. At least four people were reported killed there, apparently while trying to escape the storm. Typhoon Haiyan is expected to make landfall south of Hanoi on Monday afternoon local time, although it will have decreased markedly in strength. Tecson Lim, city administrator of Tacloban, told the Associated Press that the death toll in the city alone “could go up to 10,000”. Police chief Elmer Soria said about 70% to 80% of the area in the path of the storm in Leyte province was destroyed. The latest report from the Philippines’ Disaster Risk Reduction and Management Council confirmed 151 deaths on Saturday. It said almost 480,000 people had been reported displaced. It brought sustained winds of 147mph, with gusts of 170 mph, with waves as high as 45ft, bringing up to 15.75 inches of rain in places. The Pentagon has announced it is providing the Philippines with naval and aviation resources to help with humanitarian relief efforts. In a statement, Defense Secretary Chuck Hagel said the US was delivering helicopters, fixed-wing aircraft and search and rescue equipment after a request from the Philippines government. Red Cross officials estimate that at least 1,200 people were killed by Typhoon Haiyan, the largest storm ever to make landfall in Philippines. Typhoon Haiyan struck Philippines early Friday and survivors of the storm described towering waves that swept away all but the hardiest shelters. Survivors were described as being in desperate need of clean drinking water and food as officials continue to survey the damage. Typhoon Haiyan packed sustained winds of 147 mph, with gusts up to 170 mph, and heavy rains when it made landfall early Friday. By those measurements, Haiyan would be comparable to a strong Category 4 hurricane in the US, and nearly in the top category, a 5. Authorities said it flattened hundreds of homes and triggered mudslides, flash flooding and a storm surge with waves of up to 30 feet. Authorities said almost 800,000 people were evacuated to emergency shelters. So far, government officials have confirmed just 138 deaths. At least 118 of those were on hardest-hit Leyte Island, where Tacloban is located, national disaster agency spokesman Major Reynaldo Balido told The Associated Press. But Gwendolyn Pang, secretary general of the Philippine Red Cross, said preliminary counts from teams on the ground indicated that at least 1,200 people had perished – 1,000 people in Tacloban and at least 200 more in the Samar province. Gwendolyn Pang said the numbers came from preliminary reports by Red Cross teams on the ground. The weather system was downgraded overnight from a “super typhoon” to a typhoon, and was making its way toward Vietnam. Typhoon Haiyan has hit the central Philippines with sustained winds of 146 mph. Meteorologists say that if initial estimates based on satellite images are borne out, it could be the most powerful storm ever to make landfall. The storm has forced millions in vulnerable areas to seek shelter across 20 provinces, officials say. The region was already struggling to recover from a powerful earthquake last month. The authorities have warned that more than 12 million people are at risk from the category-five storm, including in Cebu, the country’s second largest city with a population of 2.5 million. 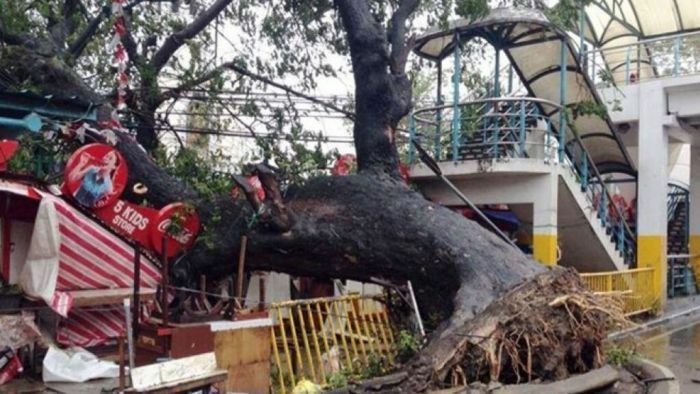 The storm – known locally as Yolanda – was not expected to directly hit the capital Manila, further north. Schools and offices closed, while ferry services and local flights were suspended. Hospitals and soldiers are on stand-by for rescue and relief operations. The extent of the damage remains unclear, with authorities saying phone-lines are down in many areas. The governor of the Southern Leyte province, Roger Mercado, tweeted on Friday morning that fallen trees were blocking roads, hampering the emergency effort. A spokesperson for the British Red Cross, Nichola Jones, who is in Tagbilaran in Bohol, says the typhoon passed by in the past hour. In the worst-hit areas of Samar and Leyte, she says there are reports of collapsed buildings, including a hotel. Jeff Masters, meteorology director at the private firm Weather Underground, said in a blog post that the damage from Haiyan’s winds must have been “perhaps the greatest wind damage any city on Earth has endured from a tropical cyclone in the past century”. State meteorologist Romeo Cajulis told AFP news agency Typhoon Haiyan had made landfall over Guiuan at 04:40. The typhoon arrived with gusts of up to 170 mph, the Philippines’ weather service said in its bulletin, issued at 05:00 local time. The US Navy’s Joint Typhoon Warning Centre, which typically gives higher readings as they are based on a shorter period of time, said shortly before Haiyan’s landfall that its maximum sustained winds were 195 mph, with gusts up to 235 mph. Waves as high as 15ft could be seen from the islands of Leyte and Samar, Reuters news agency reported. The storm is forecast to move over to the South China Sea north of Palawan Island on Saturday, meteorologists say. About 5,000 people are still living in tents in Bohol after losing their homes in the quake, which killed more than 200 people. Earlier, President Benigno Aquino warned people to leave storm-prone areas and urged seafarers to stay in port. “No typhoon can bring Filipinos to their knees if we’ll be united,” he said in a televised address. Typhoon Haiyan is heading for Philippines and is expected to strike central parts of the country on Friday. Typhoon Haiyan, a category five storm, is moving towards the South East Asian nation with winds of up to 173 mph. Some schools have already been closed and evacuations are under way in some areas. Ferry operations have been suspended and fishing boats ordered back to port. Typhoon Haiyan is expected to make landfall around noon on Friday between the islands of Samar and Leyte. It is predicted to hit central areas already struggling to recover from a 7.3-magnitude earthquake last month, including the worst-hit island of Bohol. Around 5,000 people are still living in tents in Bohol after losing their homes in the quake. Meteorologists in the Philippines warned that Haiyan could be as devastating as Typhoon Botha in 2012. 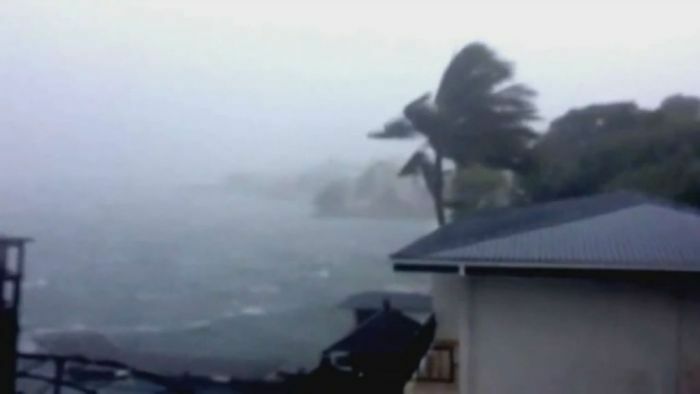 Botha devastated parts of the southern Philippines, leaving at least 1,000 people dead and causing more than $1 billion in damage. 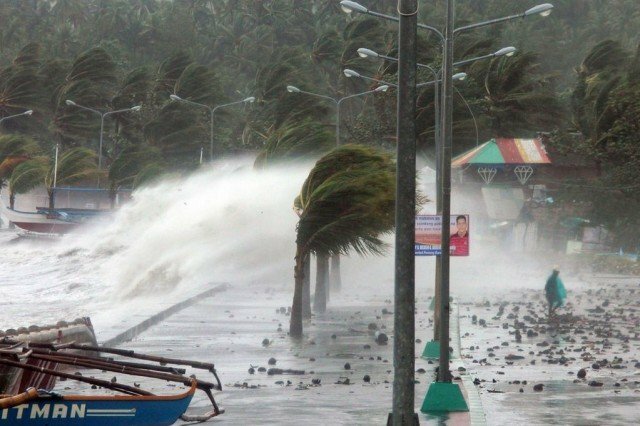 “This is a very dangerous typhoon, local officials know where the vulnerable areas are and have given instructions on evacuations,” state weather forecaster Glaiza Escullar told AFP. 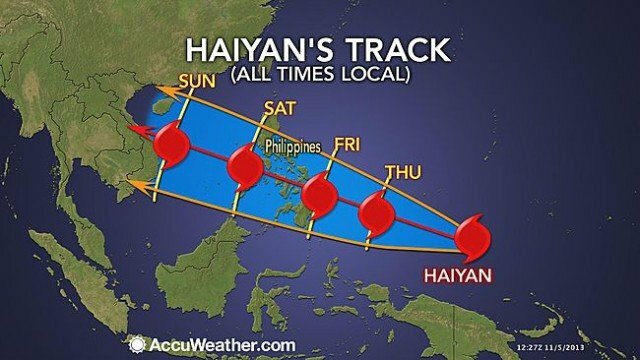 Haiyan is the 25th typhoon to enter Philippines territory this year. Typhoon Fitow has hit eastern China after triggering the evacuation of hundreds of thousands of people. With winds up to 93mph, the storm landed in Fujian province early on Monday, bringing heavy rains and causing widespread power cuts. At least two people have been killed by the typhoon, state-run news agency Xinhua reported. The authorities earlier issued the highest alert – red – for the area. Some homes are said to have collapsed in neighboring Zhejiang province and two port workers are missing. Typhoon Fitow – named after a flower – made landfall at 01:15 local time on Monday in the city of Fuding, Chinese meteorologists said. They warned that some areas in Fujian and Zhejiang could see more than 8 inches of rain in the coming hours. 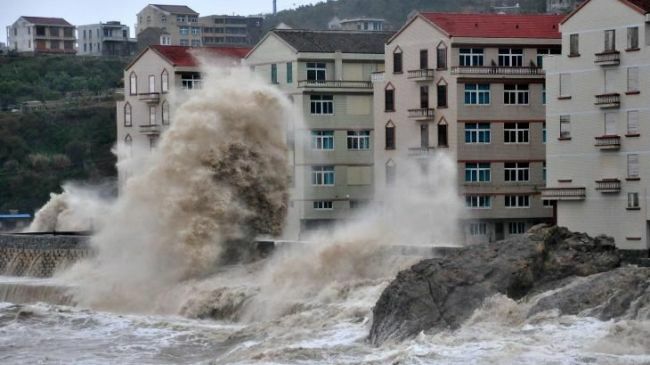 In Fujian, 177,000 people were evacuated before the storm hit the coast, Xinhua said, while in Zhejiang, some 574,000 people had to leave their homes. Some 35,000 boats in Zhejiang and 30,000 in Fujian were ordered to return to harbor for shelter. Coastal facilities such as seaside bathing centres were also closed, state media reported. “We must not leave anybody in danger,” Zhejiang Governor Li Qiang was quoted as saying. The typhoon also caused suspension of bullet trains and coach services in several cities in the area. Dozens of flights to and from Wenzhou airport in Zhejiang were cancelled. The storm is now moving north-west and is expected to weaken quickly. Typhoon Fitow is the 23rd typhoon to hit China this year, Xinhua reported. It comes just weeks after Typhoon Usagi killed at least 25 people in southern Guangdong province. 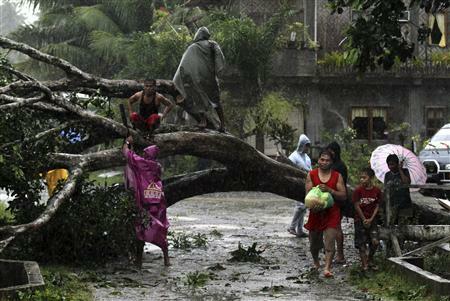 The number of people killed after Typhoon Bopha struck the southern Philippines has risen to 1,020, officials say. With nearly 850 people still missing, the toll is likely to rise further, Civil Defence chief Benito Ramos said. The storm struck the Philippines on December 4th, with the southern island of Mindanao worst affected. Many of those still unaccounted for are fishermen who went to sea before the storm hit. “The death toll will go higher,” Benito Ramos told AFP news agency. The number of people known to have died now stands at 1,020, the national disaster relief agency said. The storm displaced hundreds of thousands of people and caused severe damage to property and infrastructure. A large relief operation continues. More than 27,000 people remain in evacuation centres, with many more sheltering at the homes of friends and family. The Philippines is hit by several typhoons each year but they usually strike further to the north. Last year, Typhoon Washi left about 1,300 people dead when it struck northern Mindanao, causing rivers to burst their banks.